Great Marlow School were invited to attend an Inclusive Zone Basketball (IZB) tournament on Thursday 21st March. This unique sport is played on courts split into zones, which enables wheelchair basketball players and basketball players to play together in a squad. 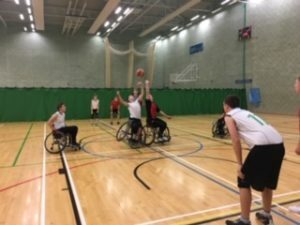 This was a great opportunity for the students to participate in a new sport, organised by British Wheelchair Basketball and Sport England. The tournament took place at the University of Brighton, and teams from secondary schools in the South East region were invited to participate in the event. The GMS team played four games. Each game was played by a squad of four players, with two wheelchair users in the central zone of the court, and one non-wheelchair user on each wing. We rotated the players for each game, as we took a team of nine students to the tournament. The GMS team played a great first game against the most experienced team- St Crispin’s School, from Wokingham. The St Crispin’s squad are very fortunate to have a GB IZB player on their team. GMS however, were undeterred by the level of skill and experience of their opponents, and only lost this first match by a small margin. For a squad who had never played IZB before, they soon mastered the rules and proved to be a real challenge to the opposing teams. As their competence and confidence grew, the GMS team displayed a level of skill and determination, which resulted in them winning their three subsequent matches. We achieved 2nd place in the tournament-a fantastic result. All students involved in this event showed great team spirit and sportsmanship throughout.